Toyota Highlander Timing Belt Kit. Complete 11 piece timing kit. Everything you need to properly service your Highlander timing belt. Includes only select matched parts from Japanese OE/OEM manufacturers. These are the same parts used and trusted by Toyota, Lexus and Technicians world-wide. Perfect OEM Fit, Quality and Durability. Meets or exceeds Toyota original equipment specifications. (2001 2002 2003 2004 2005 2006 2007). All V6 Models with 3.0 Liter / 1MZFE or 3.3 Liter / 3MZFE. Includes The Following Brand New Parts. Thermostat and Valve Covers do not need to be removed when changing timing belt. More Highlander Timing Belt Kits.. Toyota Highlander V6 Timing Belt Kit. Includes: Timing Belt, Idler Roller, Tensioner Roller, Front Crankshaft Seal, Front Camshaft Seals, Water Pump, Water Pump Gasket and Hydraulic Tensioner. Includes: Timing Belt, Idler Roller, Tensioner Roller, Front Crankshaft Seal, Front Camshaft Seals, Water Pump, Water Pump Gasket. (No Drive Belts / Hydraulic Tensioner). Includes: Timing Belt, Idler Roller and Tensioner Roller. 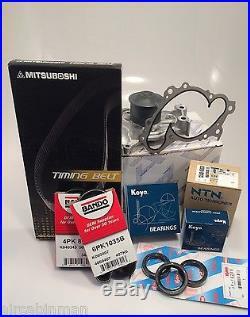 The item "Toyota Highlander V6 Timing Belt+Water Pump KIT 2001-07" is in sale since Saturday, June 18, 2011. This item is in the category "eBay Motors\Parts & Accessories\Car & Truck Parts\Engines & Components\Timing Components".